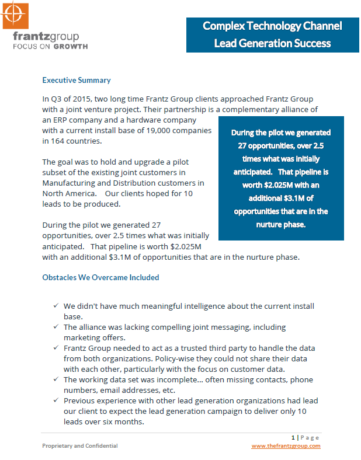 In Q3 of 2015, two long time clients approached Frantz Group with a joint venture project. Their partnership is a complementary alliance of an ERP company and a hardware company with a current install base of 19,000 companies in 164 countries. The goal was to hold and upgrade a pilot subset of the existing joint customers in Manufacturing and Distribution customers in North America, a very mature market for ERP and data center hardware sales. Our clients hoped for 10 leads to be produced. Depending on the size of the target organizations we would engage, leads would either be worked directly by our customers, or passed on to appropriate channel partners. This program served as a strong pilot of Right Offer messaging, utilizing value based messaging and new research to drive exceptional results within a technology lead generation campaign to a mature market. During the pilot we generated 27 opportunities, over 2.5 times what was initially anticipated. That pipeline is worth $2.025M with an additional $3.1M of opportunities that are in the nurture phase. We didn’t have much meaningful intelligence about the current install base. The alliance was lacking compelling joint messaging, including marketing offers. Frantz Group needed to act as a trusted third party to handle the data from both organizations. Policy-wise they could not share their data with each other, particularly with the focus on customer data. The working data set was incomplete… often missing contacts, phone numbers, email addresses, etc. Previous experience with other lead generation organizations had lead our client to expect the lead generation campaign to deliver only 10 leads over six months.